What did the disciples see on that mountain? Light. Uncreated Light, or, what the Orthodox call "Tabor Light." The light shone through Jesus while the Cloud of Presence hovered over the mountain, and time disassembled, revealing Moses and Elijah outside time. Simple men and women of prayer discover this light at the boundary of the soul. Paul was struck blind by it on the road to Damascus. An interesting theory in Eastern Orthodoxy is that the fire of hell is simply uncreated light but the unreconciled soul cannot appropriate this light and is burned by it. The meditation prompts begin from the point of view of the disciples: "was it a vision?" (meditation one). Next, Augustine tries to explain this light in his own soul (meditation two). And Pseudo-Dionysius wraps it up and sends us forth: "But there is something more...in its power to unify, it stirs us by lifting us up" returning and gathering us up into the oneness of the Holy One (meditation three). Leave aside this everywhere and this everything, in exchange for this nowhere and this nothing. Never mind at all if your senses have no understanding of this nothing; it is for this reason that I love it so much the better. It is so worthy a thing in itself that they can have no understanding of it. This nothing can be better felt than seen; it is most obscure and dark to those who have been looking at it only for a very short while. Yet to speak more truly, a soul is more blinded in experiencing it because of the abundance of spiritual light than for any darkness or lack of bodily light. Who is he that calls it nothing? It is surely our outward man, not our inward. Our inward man calls it All, for because of it he is well taught to have understanding of all things bodily or spiritual, without any specific knowledge of any one thing in itself. ...so also when the soul is perfectly illumined with the ineffable beauty and glory of the light of Christ�s countenance, and granted perfect communion with the Holy Spirit and counted worthy to become the dwelling-place and throne of God, then the soul becomes all eye, all light, all face, all glory, all spirit. Almighty, victorious thy great Name we praise. "Every good endowment and every perfect gift is from above, coming down from the Father of lights." But there is something more. Inspired by the Father, each procession of the Light spreads itself generously toward us, and, in its power to unify, it stirs us by lifting us up. It returns us back to the oneness and deifying simplicity of the Father who gathers us in. For, as the sacred Word says, "from him and to him are all things." Let us, then, call upon Jesus, the Light of the Father, the "true light enlightening every man coming into the world," "through whom we have obtained access" to the Father, the light which is the source of all light. Then perhaps it will be his will to send out a ray of spiritual light, piercing this cloud of unknowing between you and him, and he will show you some of his secrets, of which man may not or cannot speak. Then you shall feel your affection all aflame with the fire of his love, far more than I know how to tell you or may or wish to at the time. Jesus, transfigured in Uncreated Light, converses with Moses and Elijah outside of time. Peter, James, and John fall into a sleepy ecstasy. In iconography the disciples topple down the mountain in awe and fear. A detail that always touches my heart is the sandal falling off the foot of the disciple on the right. Does it mean the disciple finds himself on holy ground unprepared? Or does the shock of theophany knock him literally out of his shoe? 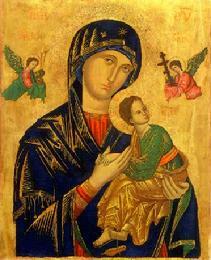 Jesus' own sandal falls off his foot, dangling, as he runs into his mothers arms in the icon of Our Mother of Perpetual Help, (or, in the Eastern Orthodox rendering, Theotokos of the Passion). In this icon (13th, 14th, or 15th century) Jesus clings to his mother for comfort as he sees a vision of the Archangels Michael and Gabriel carrying the instruments of the Passion: spear, nails, cross, and sponge. 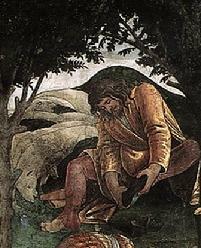 When Moses approached the Burning Bush, he was instructed to remove his shoes because he was on Holy Ground. Liminal spaces, “thin places,” sanctuaries set apart for solemn worship teach us to practice for the eventual realization that all places are holy.